But what was it? A crinoid, as many of you probably guessed, but not just any crinoid. This particular fossil is a holotype specimen for the species Cupulocrinus crossmani, as published in the Journal of Paleontology. While there are still plenty of crinoids around in modern oceans, back in the day they were a predominant form of life. Some fossil beds from the mid to late Paleozoic are composed almost entirely of piles and piles of crinoid parts. These organisms have and had a flower-like appearance, but they are in fact animals. The petal-like arms, which can be seen to display a huge variety of intense pigments today, serve to collect particulate food from the environment. The mouth is right at the heart of this “flower.” While the crinoids have a pretty tightly preserved body structure, in the fossil record they vary greatly in size. This week’s specimen was very small; around three centimeters. However, crinoid fossils have been found up to forty meters in length. The winner this week? Once again, it's gazzang, with some nice genus level identification! Congratulations, and thanks for playing! If you have a fossil you want to share, send your pictures to me at schoerning at ncse.com. 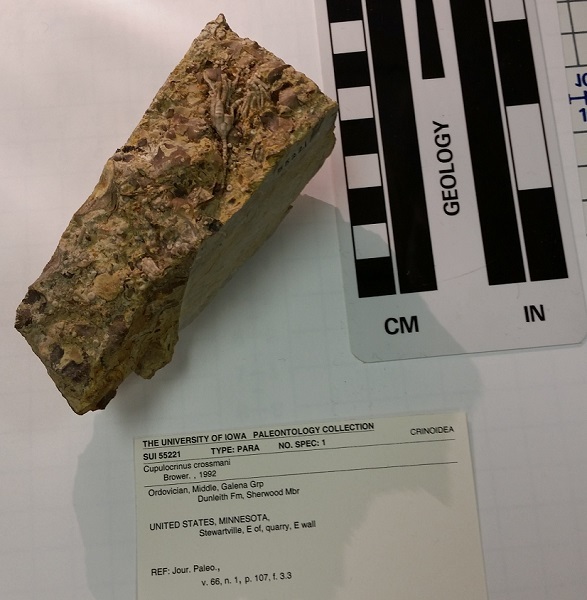 And if you need another fossil fix, check out the UIowa Palentology Repository, which we thank for this week's fossil!